Sellier and Bellot is one of the most well-known ammunition companies around the world. 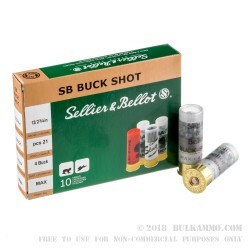 Started in 1825, Sellier and Bellot has been making its mark on the ammo market since the beginning. Sellier and Bellot has had a few changes over the years, with one the major ones being its acquisition by ammo manufacturer MAGTECH. Their manufacturing techniques are at the height of technology, produce high quality cartridges, and they continue to set the standard with their innovations in the industry. 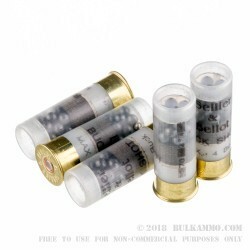 These Sellier and Bellot 12-gauge shells are loaded with twenty-one (21) Lead #4 buck shot pellets and have a 2-3/4" overall length post firing. These use reloadable, non-corrosively primed, clear plastic roll crimped hulls with S&B wads for tighter patterning, and mid-height brass ends. They have a muzzle velocity of 1210 feet per second and are suitable for various game animals. The #4 buck shot is 0.240" inch in diameter, and capable of hunting predators that are roughly the size of coyote and deer. Some folks stick to using 00-Buck, however, number 4 buck shot is a popular home defense load these days as well. People are choosing #4 buck because it hits hard like all buck shot does, and it usually won't “over-penetrate”. The 21 pellets in each shell are .240" inch in diameter (That’s comparable to being shot at by a .25 ACP pistol, or rather 21 of those pistols, all at the same time), and they are moving at 1210 feet per second. Those pellets, in that quantity, moving at that speed, sends a clear message. Hence the reason it’s a popular choice for home defense. 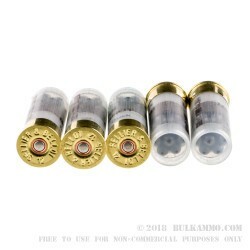 This 12 gauge buckshot comes in packs of 10 shells, and at this great price, you can stock up and have enough ammo for target shooting, 3-Gun matches, home defense, or any other shotgun activities you want to take on.